ジャンルを選ぶGuitarAcoustic / Electric Acoustic GuitarUkuleleBass GuitarAmplifierEffectorKeyboardDTMRecord &Public AddressDrumPercussionDJ EquipmentSaxophoneTrumpetStrings & Accessory, Replacement Parts etc. ※Basically we carry new items for the customer who live in Japan. For overseas customer who have interest in purchase of used items, please send your information to us through inquiry form. 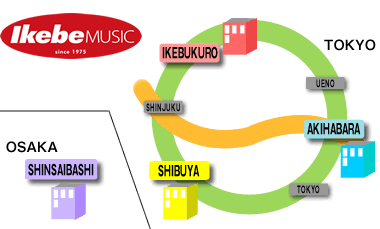 Ikebe Musical Instruments Store was established in 1975 and is managing 30 stores present a specialized shop in response to the needs of various customers in Japan. Mainly on the retail trade of the musical instrument, we support a player enjoying a musical instrument by carrying out a planning, development, production, the wholesale of the house brand product and also the administration of a rehearsal studio, a recording studio, the live house with every effort !